A beautiful exhibition has just opened at Vernon’s museum. A must see if you come to Giverny! It is entitled ”From Corot to Bonnard, masterpieces from the museums of Douai and Vernon” and features an impressive list of reknown artists such as Monet, Pissarro, Vuillard, Corot, Courbet, Bonnard and many more. The visit leads you from the early stage of pre-impressionism to impressionism in its glory, followed by néo-impressionist works. a feast for the eyes! 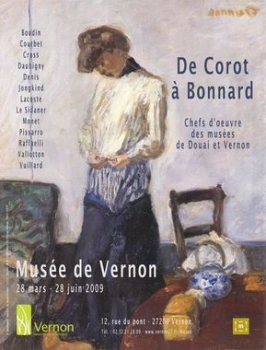 The exhibition is to be seen at Vernon’s museum for three months until June 28.